Dissolve jello in boiling water. Drain fruit and add juice to jello (no more than 2 cups). 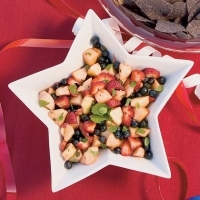 Let partially set, then add fruit. Return to refrigerator to completely jell.Topping:8 oz. cream cheese8 oz. sour cream1/2 c. sugar1 tsp. vanilla1/2 c. nuts Combine all ingredients for topping and mix well. Top firmly jelled jello. 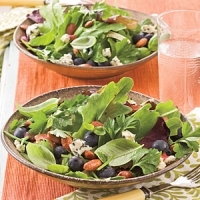 Recipe categories: Salads, Blueberries, Berries.